Growing up, halloween was such a fun and magical time. It was made even more memorable because my mom always made my costumes. We would go to the fabric store, thumb through the pattern books, and she would let me and my sister choose our costumes. We would return home with just the right fabric in-hand, get measured, cut the pattern, and watch the magic unfold. This process was always so much more meaningful than just picking some plastic piece of junk off the rack. My most vivid Halloween memory was the year I went as Jeannie from I Dream of Jeannie. I loved that costume. I wore it around the house for a month. I’m so happy to continue that tradition with my own daughter. 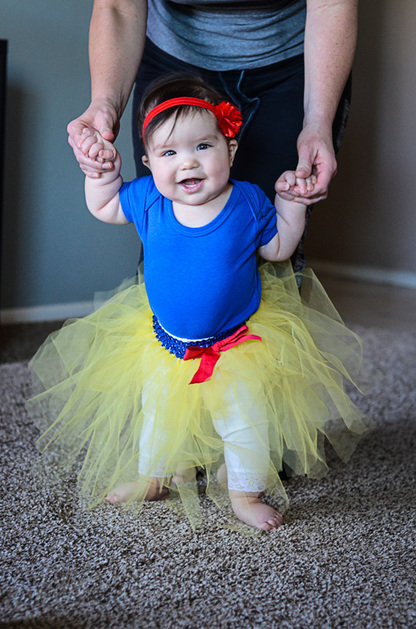 Even though she was only 6 months old her first Halloween, I couldn’t help but put together a simple costume for her. With her gorgeous brown hair and fair skin she just had to be Snow White. 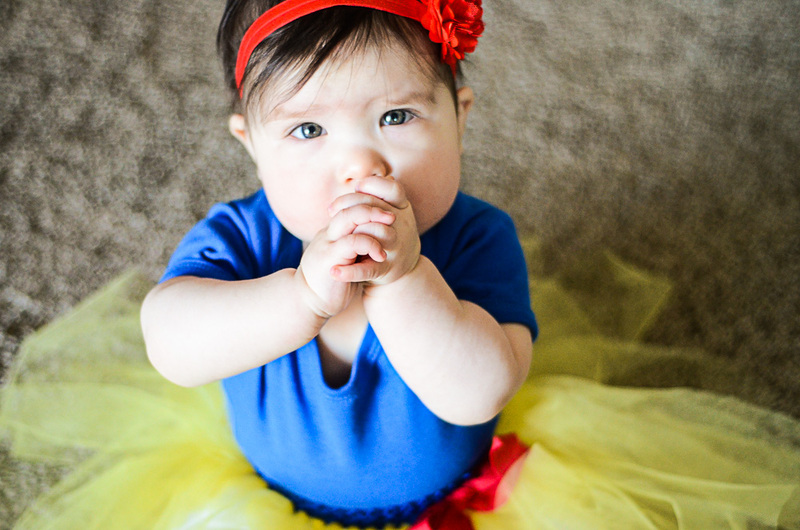 I found a royal blue onesie and crafted a simple yellow tutu made of tool with a cute little red headband. 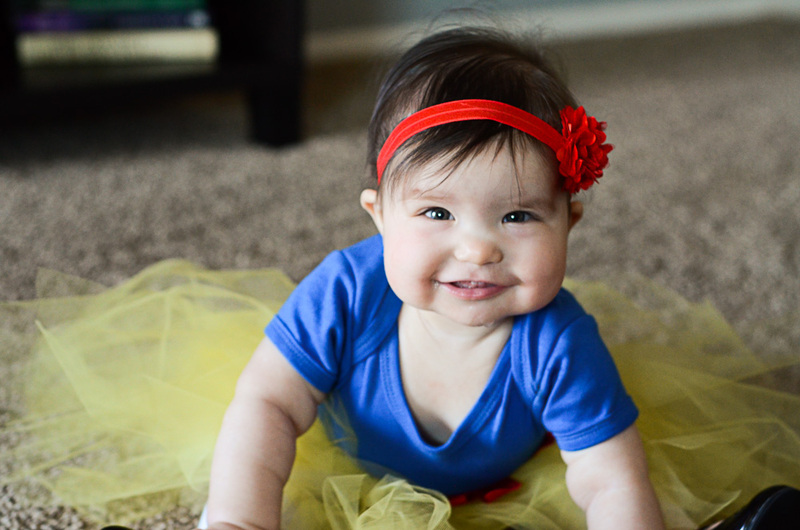 I’m biased, but she was just the cutest Snow White with her big smile and little rosy cheeks. She had fun at first but just wasn’t quite ready for the big event. Fingers crossed she enjoys next year. 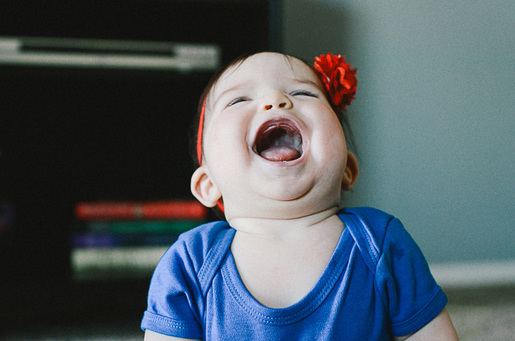 ← Mommy Makers: Shop small and make a big impact.